There are so many different ways to save energy. Making sun tea is just one of them. Frankly, I think it tastes better too. Find a nice lidded quart container, like a glass canning jar. I use antique blue Ball jars that I inherited from my grandmother. I suspect these jars date back to the 1930s. Fill the jar with room temperature tap water. If you want to take out the organics and chlorine, you can use water that has been through a Brita filter. Not necessary, but again, I think it tastes better. Add two tea bags. Let the jar sit for a couple of hours. It doesn’t have to be in the sun at all. 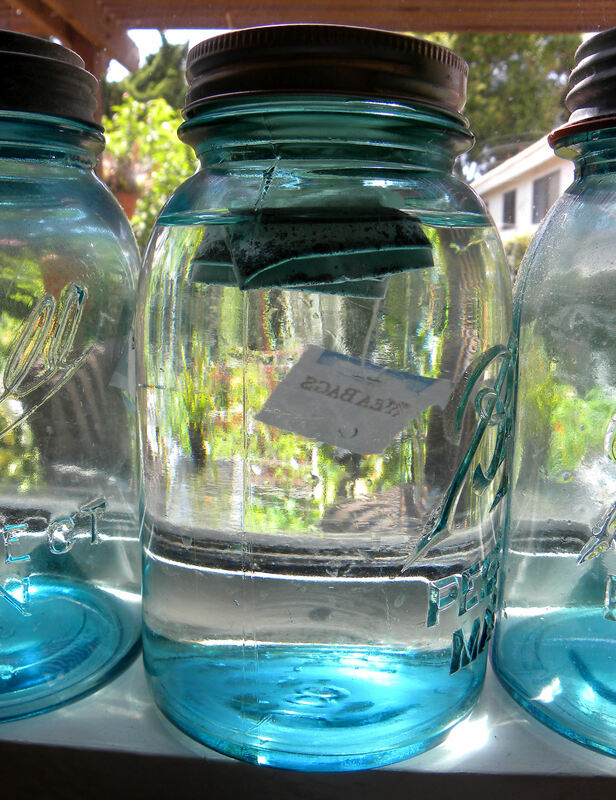 I love the way the afternoon sun filters through the blue jars, so I set mine on the windowsill. After about two hours, you have tea. 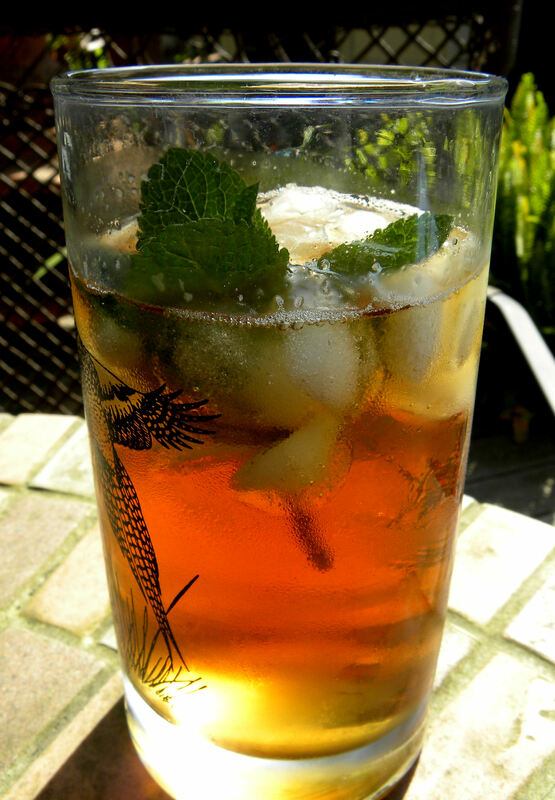 You can pour the iced tea over ice cubes if you want to drink it right away, or chill it in the refrigerator for later. I like to add a sprig of mint from my garden. I could add a lemon wedge, since I have lemons growing in the garden, but I rarely do. I drink my tea unsweetened, but you can add sugar if that is your preference. Before I started using this method, I would heat water on the stove (or in the microwave in more recent years) before adding the tea bags. The tea brewed quickly, but then it took a long time to cool down. It takes energy to both heat water and make ice, so the less heat and ice that is used, the more energy saved. Every little bit matters. Why? Well, dams are silting up and water levels are dropping in the lakes behind Hoover and Glen Canyon dams. If the water levels fall too far, those dams will stop producing electricity. With global climate change and drought, snow levels are decreasing in the Rockies and Eastern Sierras, which means less runoff, which means less energy produced by those dams. Coal-fired plants put pollutants (including carbon dioxide) into the atmosphere. Nuclear powered plants produce hazardous waste and are limited in the number of years that they can operate. I just don’t think that they are safe. We can’t afford solar panels on our roof, in part because we use so little electricity that we don’t qualify for rebates. We try to conserve energy and reduce our carbon footprint however we can. 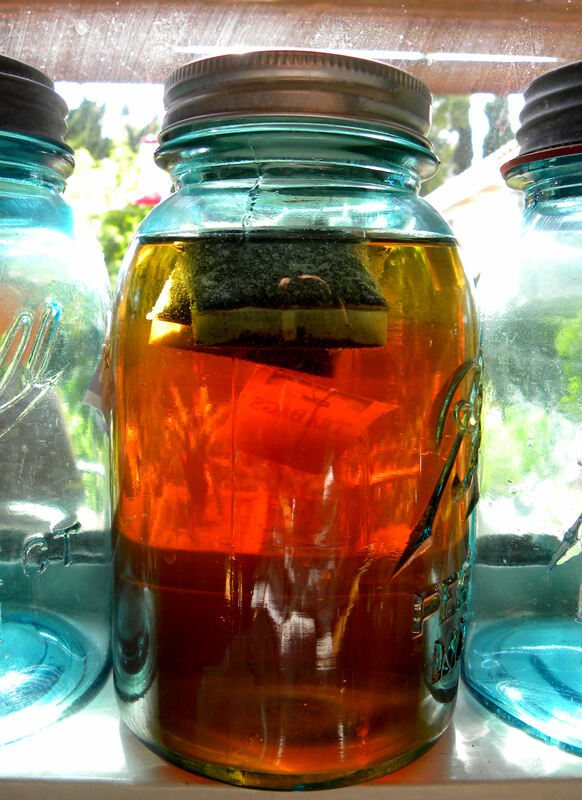 Making sun tea is just one tiny bit of what we do in our fight to save Mother Earth. This entry was posted in Uncategorized and tagged global warming, how to, iced tea, make, save energy, sun tea. Bookmark the permalink. Read & believe what you will…i personally have been enjoying sun tea for over 40 years…with NO problems. ..of any kind.